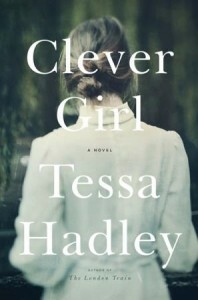 I have to confess, I had a bit of struggle getting into Clever Girl, not because the writing was bad – it’s not – Tessa Hadley is a detailed and compelling author – but because of the formatting. You see, instead of quotation marks, dashes are used throughout to set off dialogue. (Note: my review is based on an ARC, and I’m not certain if that formatting remained in the final version.). It’s not a structure I’m unfamiliar with – a lot of English novels use it (and a few American ones, as well), though it’s not something you often see in contemporary literature – and at times I found myself confused about exactly who was speaking because there was a hard-return that hadn’t translated, or because I’d missed a dash. Formatting aside, however, Clever Girl really captured my attention and imagination. I love that the lead character, Stella, was so well drawn, so specific, that even when she meets a neighbor as a child her observation is that the other girl doesn’t have high standards in selecting friends. It’s difficult for me to review this other than to point out that this is Stella’s story, told by Stella, and while many people think writing an entire novel in first person is easy, I promise you it’s NOT. But Tessa Hadley makes it seem easy, and I finished the book feeling as though I’d made a new friend in Stella, and hoping my standards were up to hers. Goes well with Curry and a really crisp hard cider. This post is part of a book tour hosted by TLC Book Tours. For the entire tour schedule, click here.